Acne. Goodness, is there a person on the planet who hasn’t struggled with acne at one point in their life, if not more? I remember going to dermatologists growing up in search of something that would help with my acne and breakouts. I never had horrible skin as a teen, but as I got into college I struggled with terrible terrible acne – the type that crippled me with insecurity and sent me into a tailspin searching for any and every product that would remedy my issues. I tried the harshest of harsh products, thinking that instead of “less is more” I would take the “more is more” approach to treating my acne. Well, spoiler alert, because more really isn’t more. Harsh products really aren’t the solution. Stripping the skin with harmful ingredients might work for a time but won’t be the long-term solution to acne if you’re really looking for a solution that sticks. My days of dealing with acne are behind me, healed by embracing a gentler approach to skincare and working to fix some of the underlying hormonal imbalances that were connected to my breakouts. During the times that I was struggling with acne the worst I was also at my heaviest weight, severely under-eating and over-exercising and wreaking havoc on my hormones. And we know the correlation between hormones and acne! But what about those who are eating the right things and doing all they can but still struggle with pesky, humiliating breakouts and/or oily skin? For the last three years that I’ve been working with Beautycounter, when clients and readers have asked me for my recommendations for this type of skin, I’ve only had a few products in my arsenal that I could recommend: namely the Balancing Charcoal Mask, Charcoal Cleansing Bar, Balancing Face Oil, etc. These products are great, don’t get me wrong, but they are individual products rather than a cohesive line geared toward targeting and treating breakouts and the root imbalances in the skin. Today, that all changes! 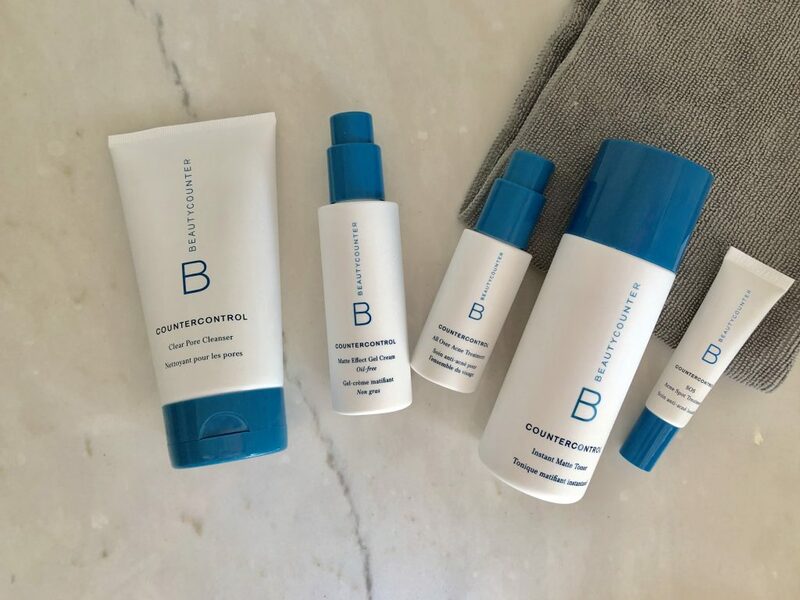 Beautycounter launched our newest line targeted specifically for those with oily and/or acne-prone skin. 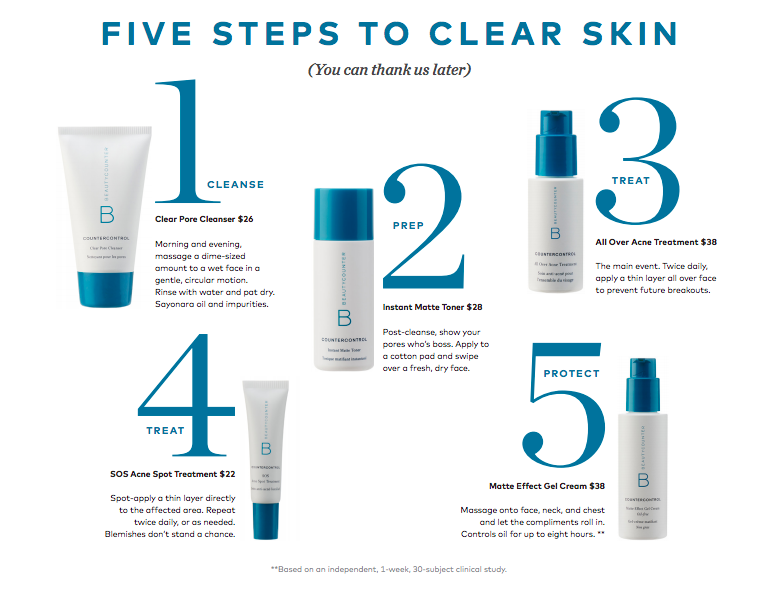 It’s our lowest price-point skincare lined, designed with five steps to treat AND prevent acne and keep oily skin under control without stripping the skin of the moisture it needs. You can see all the steps below! For someone like me, who doesn’t have oily skin but is still prone to the occasional breakout, I’ve been working in the Clear Pore Cleanser, Instant Matte Toner and the SOS Spot Treatment (as needed on breakouts) into my current skincare routine. And I kid you not, my husband, who is NOT a product junkie or prone to want to use much skincare got mad at me when I gave away the cleanser because he loves it so much. That’s really saying something! 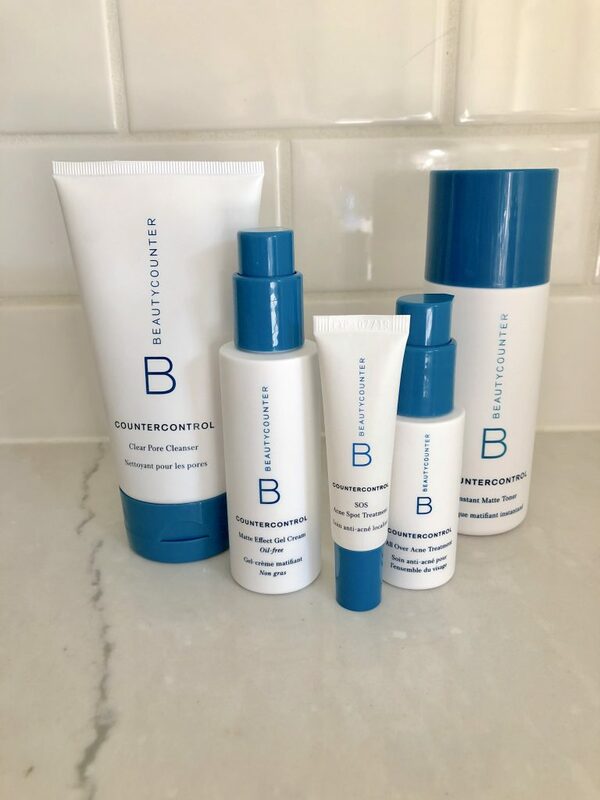 As you know, if you ever have questions about finding a skincare routine that’s right for you – made without harmful ingredients and targeted to treat whatever issues your skin may have – you can email me ANY time for a personalized skincare consultation. I love connecting and working with you all and it brings me so much JOY to work with readers to help people feel great about their skin without sacrificing their health and safety.